HKTDC ICT Expo - Yusata Infotech Pvt. Ltd. 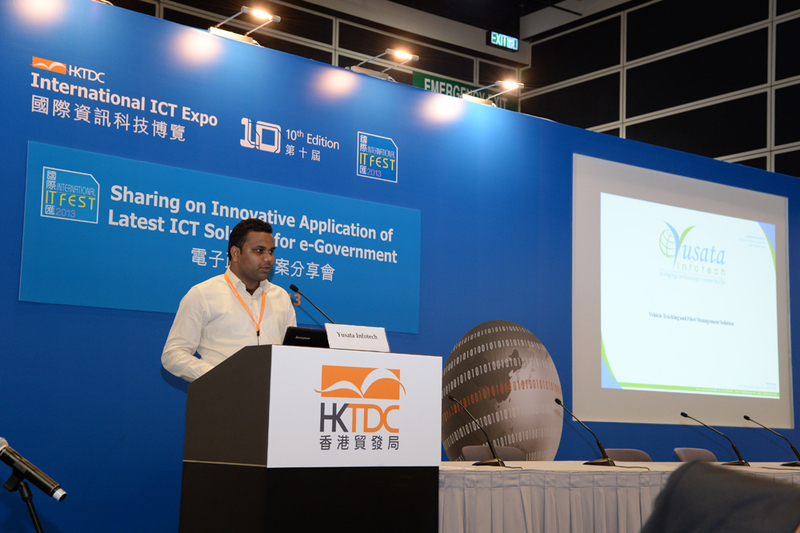 The HKTDC International ICT Expo is Asia's leading ICT show. This powerful platform for the smartest ideas in information and communications technology links product and service providers with buyers from around the world. A total of 590 exhibitors from 10 countries and regions took part in the 2012 event, including group representations from Australia, Canada, the Chinese mainland, India, Japan, Malaysia, New Zealand and Taiwan. Mr. Sunil Karwasra from Yusata Infotech giving presentation on Vehicle Tracking and Fleet Management Solution in Sharing on Innovative Application on Latest ICT Solutions for e-Government session. We would like to thank these delegates for making their presence at our booth in ICT Expo 2013. Shen Zhen Givoe Technology co. ltd.
Zhuhai Fortune Digital Technology Co. Ltd.
Tianzehua (HK) Industry Limited Shenzhen Gostar Electronics Co Ltd.
China Comservice, Guangdong Palnning And Designing Institute of Telecommunication Co. Ltd.
Omni Health & Fitness Group Ltd.
Easy International Holdings Co. Ltd.
Guangzhou Grandgift Photoelectric Technoloy co Ltd.
Shenzhen SouthYusen Electron Co Ltd.
Utech (Beijing) technology Co Ltd.